Last month I completed Julie’s four week course: Flower Arranging for Busy Mums and today I have put my skills to the test by making a floral tribute for my Auntie Eileen who passed away recently. I know it’s not a patch on a floral arrangement you would buy from a florist, but the important thing is that it has been made with love and with Eileen’s favourite colours. I’ve included some bought British flowers, some flowers and greenery from my own garden, a couple of silk hydrangeas that were in Eileen’s front room, and tucked in amongst them, is a tissue, as Eileen never went anywhere without one. I’ve also made my own little arrangement at home using flowers from Eileen’s garden, in her 1930s Sylvac vase. It’s displayed on her Queen Anne table which, as you can see, now has pride of place in my hall. Thanks Julie for getting me to this level of confidence! This is a perfect course for people who are time strapped and cannot attend a weekly class. I can’t believe how much I was able to learn online and with Julie’s support. The great thing for me was the video step by step guides, followed up by one to one tuition to know how to improve for next time. I am a keen gardener, so plants are in my blood anyway, but this has really reignited my passion for flowers and encouraged me to bring them indoors! I find myself going round the garden and thinking ‘that would look good in a vase’. Also, my vase collection has expanded massively as I cannot pass a charity shop without picking up another! I recommend this to anyone with even a passing interest in flowers as it will change the way you look at them forever. This week’s homework for my Julie Davies Flower Workshop course was to create an arrangement in a jug. All the flowers and foliage this week have come from my garden: hebe (two types), Russian vine, pyracantha berries, euonymus, yellow daisy, rose, hypericum and nicotiana. I’m finding it tricker as each week goes by but feel that I am definitely improving and I am loving the challenge! I’m looking forward to making some more seasonal arrangements now that I have some basic knowledge. Last week I wrote about the flower arranging course I was doing with Julie Davies Flower Workshops. Well, it’s time for week two homework: a tea cup arrangement. I bought the tea cup and saucer for £2 in an antique shop in Chester and my first thought was to try and mirror the colours in the china. I chose a yellow daisy, euonymus, ivy and hebe foliage, all from the garden and set about following Julie’s online instructions on putting it all together. First I cut the flower foam to size and soaked it, while I conditioned my flowers and foliage in a jug of water. Next (and this is where it goes a bit wrong) I tried to arrange them artfully as directed by Julie. Somehow I don’t think the balance is right, but practice makes perfect and Julie will give me feedback so that I can do better next time. 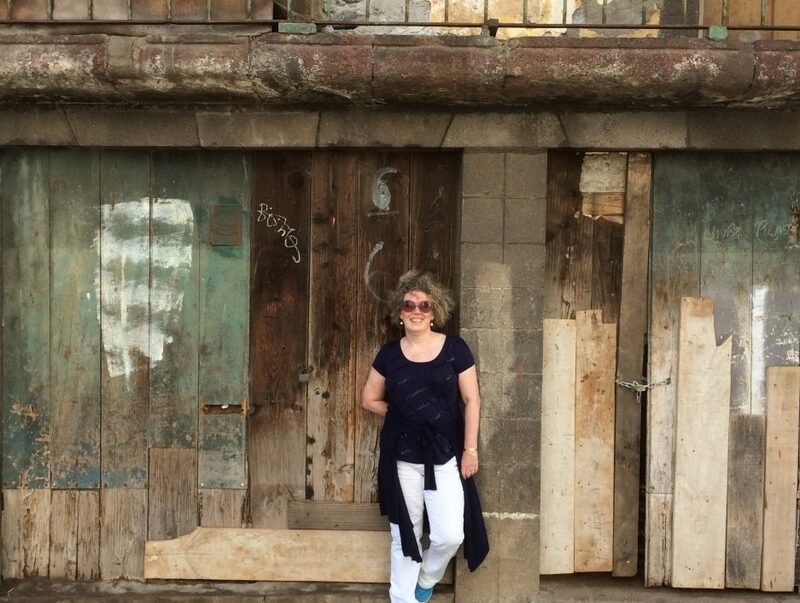 If you fancy a go yourself, Julie’s next online course starts on 26 September. I was invited to take part in a four week online course with Julie Davies Flower Workshops and review it on my blog. You might wonder how you can learn to arrange flowers via online tutorials, but time will tell, as they say, and you can follow my progress if you like, to see if I am improving. You can read more about Julie’s workshops below, but for starters, let’s have a look at my week one effort. Firstly we were asked to arrange a jug of flowers in our own way (scruffy and plonked in a vase in my case). This is my first attempt with flowers from my own garden. Please ignore the sultanas, we put them out for the blackbirds! In this arrangement we have Japanese anemone, lavender, verbena bonariensis, sweet pea and climbing rose. Next, we were given instructions on how to make an arrangement in a tank vase, which I did this afternoon. I bought a bunch of eryngium from our local florist in Hoole, and added a few sprigs of lavender from the garden. I didn’t have a tank vase but I found this in the Claire House Hospice shop for £4. Comparing the two I can see a definite improvement already. I’ve put it on the coffee table in the lounge for now, and anticipate that the house will be full of flowers by the end of the month. If you fancy having a go yourself, have a read of Julie’s introduction…..
Are you too busy to commit to a regular flower arranging class? If so, this 4-week online flower arranging class is for you. Take the lessons in the comfort of your own home anywhere in the world, whenever you have some free time. There’s no real time commitment. Via three emails a week we’ll talk about finding the “happy” place for your flowers, whether flower food works, the visual value of your flowers and choosing flowers for different events. Each week will end with a practical task – using a mix of written instructions, photo tutorials and video. We’ll make a contemporary arrangement in a class vase, an arrangement in a vintage tea cup and saucer, an informal arrangement in a jug and a tied posy. You can take the lessons at a time to suit you – join in week by week, or stagger them out to suit you. I’ll be on-hand throughout to give you support and feedback through a dedicated private Facebook group. The tips and tricks you’ll pick up will give you ideas to wow your friends and family with for years to come! Julie Davies is The Florist. That Teaches. After many years in an office-based career, Julie retrained as a florist in 2004, but wasn’t happy with just providing displays for funerals and weddings. Her real passion is teaching, watching her students bring flowers to life, and seeing their joy as the stresses and strains of everyday life melt away in the therapy of arranging flowers. Julie teaches a variety of flower arranging classes, for women looking for an alternative book club or girls’ night in, to clients with mental health issues as a part of their therapy, and even pop-up workshops at beautiful locations in Kent. She’s grown her flower arranging business from the kitchen table to deliver online flower arranging classes to kitchen tables all around the country. Technology now means you can take your first steps on your flower adventure snuggled up on the sofa with your tablet, during your lunch break, or at the kitchen table after the children are in bed. I’ve been there. And I’m still here with you – taking in floral images on Pinterest and cutting out pages from my favourite magazines for inspiration. My next paid 4-week online class starts on 26 September and is priced at £99. Everything’s looking very pretty this month, if a bit scruffy round the edges. 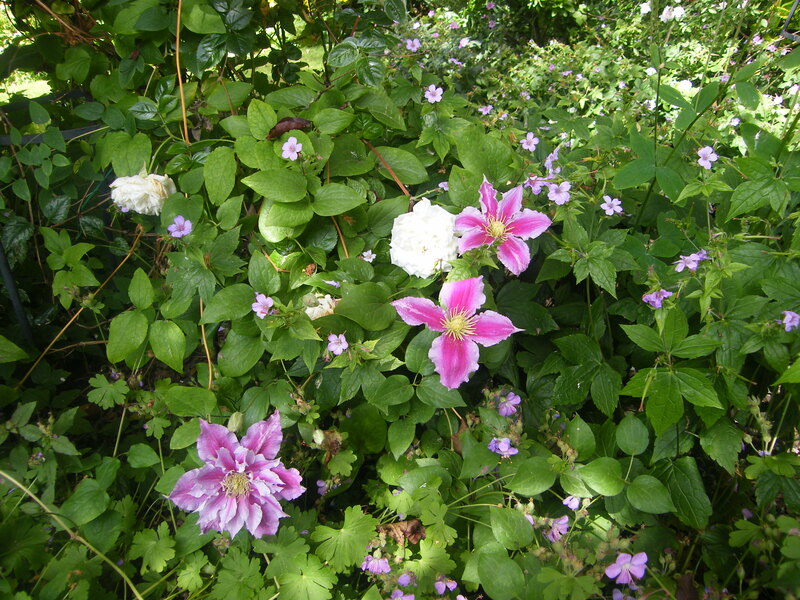 Lots of clematis and roses in bloom and I think the garden is at its most ‘cottage’ like at this time of year. 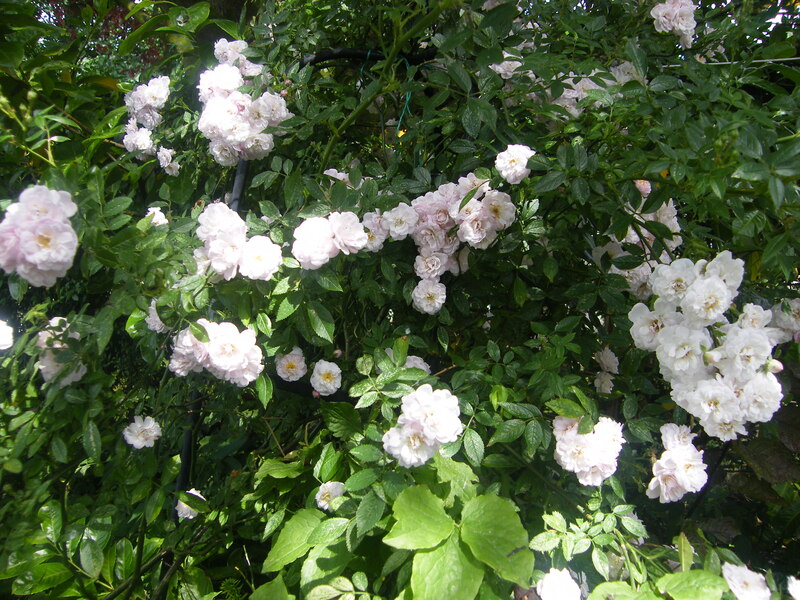 This climbing rose is doing well this time. 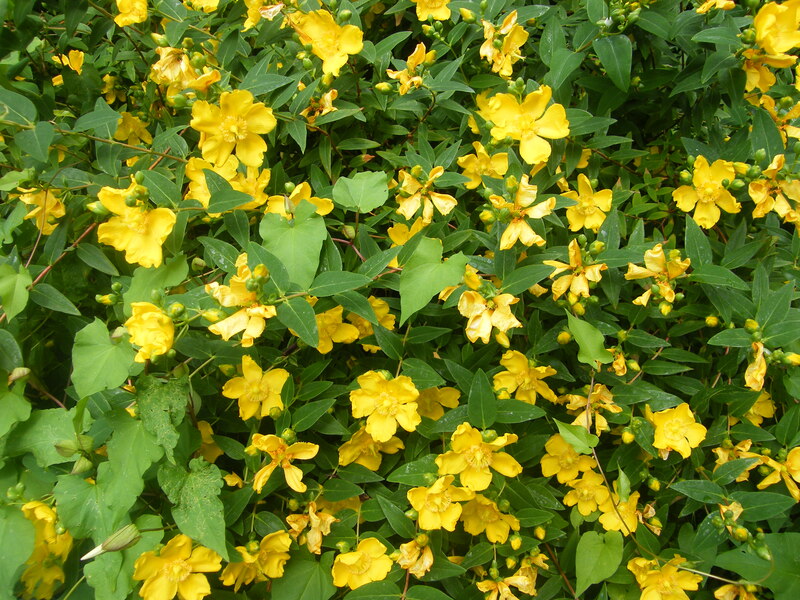 At the bottom of the garden, this hypericum is adding a splash of yellow. Spot the weed growing through it – must deal with that! The veggie pots have done reasonably well, but as we left the country at the hottest time of the year, leaving the pots almost unattended, apart from the odd visit form a friendly neighbour, the courgettes sadly perished. 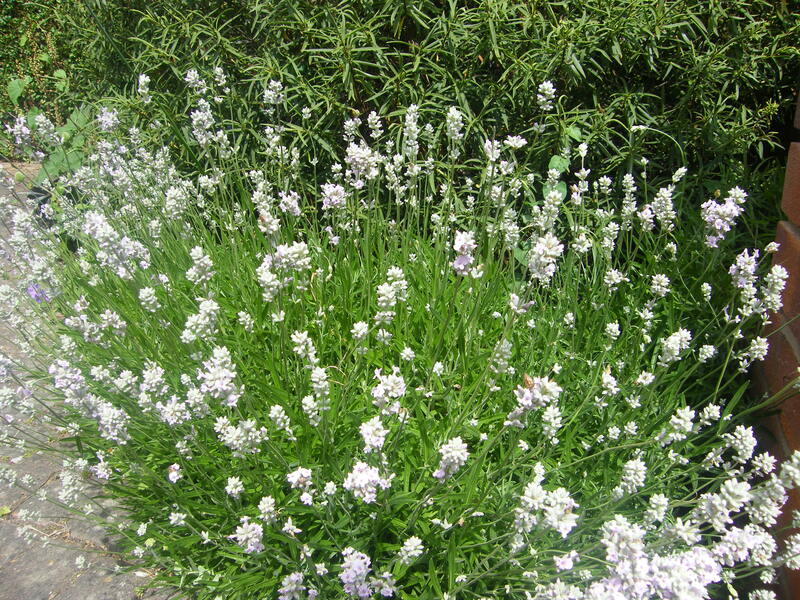 Finally, this delicately scented lavender next to the front drive has been attracting bees for weeks now.